Linen is the ideal summer fabric - light, breathable, and as I discovered at the beach, dries very easily! I've included two hijabs to go with this blue abaya - which would you choose? 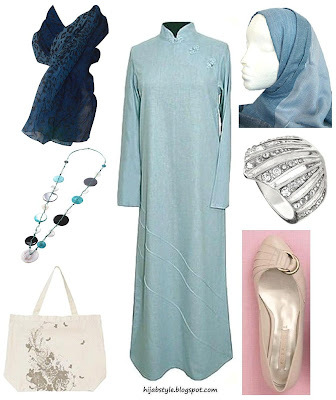 Light blue abaya £25.99, Hijab Now; blue ombre animal scarf £10, Dorothy Perkins; coloured beads necklace £3.50, Promod; future organic shopper £5, Oasis; blue hijab £4.99, Islam Orient; deco fan ring £5, Dorothy Perkins; ivory ballerina shoes £30, Next. I like the lighter one best. funnily enough I saw a lady today with a similar outfit but her's was a creamish colour, Mashallah she looked very beautiful. love this blue mashallah, im also looking for one in pink inshallah will look for one on the site. the printed hijab gives off a more trendy exotic heir. the lighter, a more classy sophisticated chic feel. salam aléicoum ! mabrouk aid ! can I use this picture from your blog to my blog ? I want to do an article about the abaya incha ALLAH .